Did you know that you can find four UNESCO World Heritage sites in London? Although London is one of the world’s great modern capitals, it has a history stretching back to Roman times. London’s four UNESCO World Heritage sites are: Palace of Westminster, Westminster Abbey & St. Margaret’s Church, the Tower of London, Royal Botanic Gardens Kew, and Maritime Greenwich. 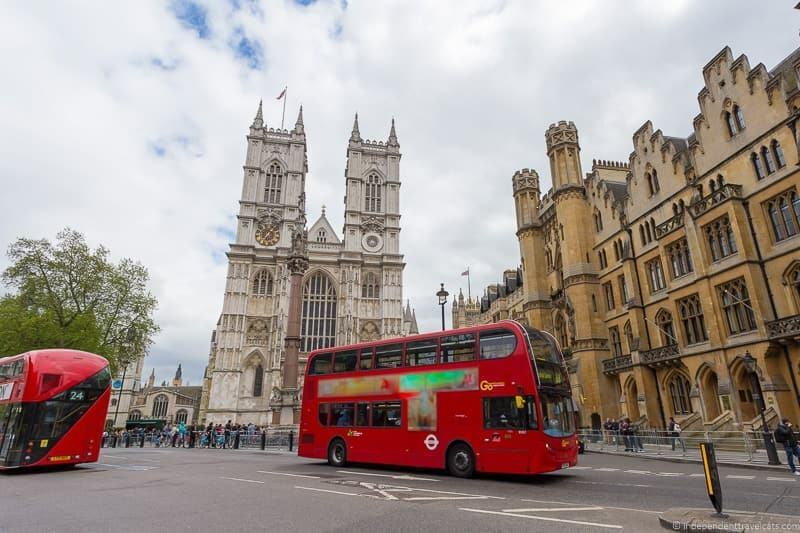 Each of these sites has been determined by UNESCO to represent an “outstanding universal value”, and are all top visitor attractions in London. We’ve visited all these sites, and we’ll tell you about each of these London World Heritage sites and give tips on visiting each of them during your trip. 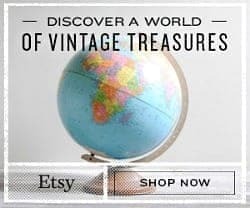 If you are wondering what exactly a World Heritage site is, it is a landmark or area that the United Nations Educational, Scientific, and Cultural Organization (UNESCO) has deemed to have cultural, historical, scientific, or other form of significance. The actual criteria met by each site is different but it must be judged as having outstanding universal value. The designated sites are given legal protection by international treaties. The United Kingdom has a a fair number of sites, currently over 30. London has four World Heritage sites, making it one of the cities with the most separately inscribed sites in the world. We’ll tell you a little about each of London’s World Heritage sites and all you need to know to visit each one of them. Note that although London has four separately inscribed World Heritage sites, two of the sites actually include a number of buildings. The Westminster designation includes 3 main buildings and the Greenwich designation protects an entire area with at least 9 significant sites. If you wanting to visit each of them, you could do so during a 2 to 3 day stay in London. I’d recommend at least 3 days though to see all four. I’d recommend allotting at least 3 hours to both Kew Gardens and the Tower of London, several hours at the Westminster sites if you book a Parliament tour, and a full day exploring Greenwich. 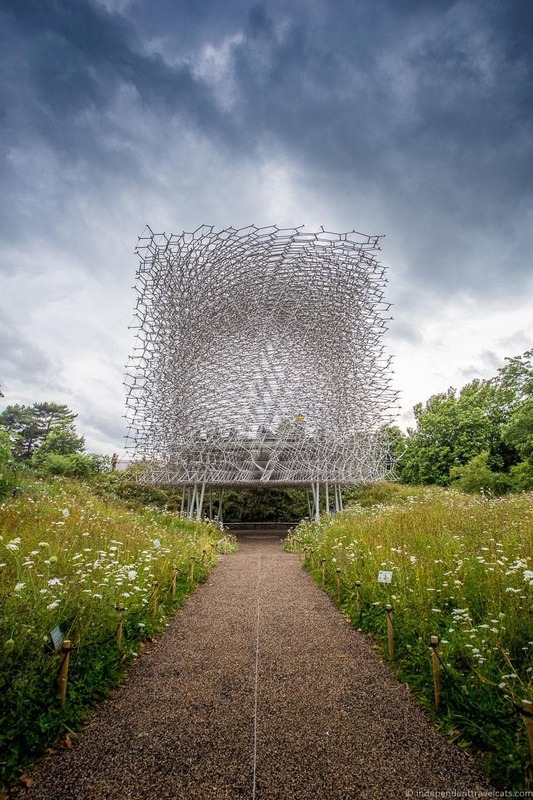 However, you could also easily spend a full day in Kew Gardens if you are a lover of botanic gardens and visit all the garden’s art galleries, royal sites, and glasshouses. So plan your time accordingly depending on your interest level and how fast your tend to sightsee. The sites are spread out within London and not within close walking distances. So you’ll need to use public transportation, a hop-on, hop-off sightseeing bus, or a taxi to get from site to site. Check out our London public transportation guide and Oyster Card tips for more information on getting around London. 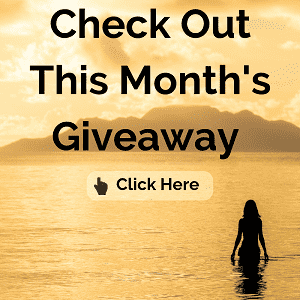 The London Pass includes free entry to most of these sites and you can read our London Pass review to see if it is a good deal for you or not. All 4 World Heritage sites are included in our detailed 6 day London itinerary which may be helpful in planning your time in London. The Palace of Westminster, Westminster Abbey & Saint Margaret’s Church were inscribed by UNESCO in 1987 as a World Heritage site. Each of these buildings are of significant historical and cultural interest, they tell the story of the kingdom’s transition from a feudal society to a modern parliamentary democracy under a constitutional monarchy. The buildings have close links with the monarchy, UK Parliament, and the Church of England. The buildings are also of significant architectural interest, showcasing architectural styles dating back 1,000 years to the modern era. You can easily visit all three of these buildings at the same time as they are located near one another. You can actually see all three of them from Parliament Square, and each is only a minute or two walk from the square. 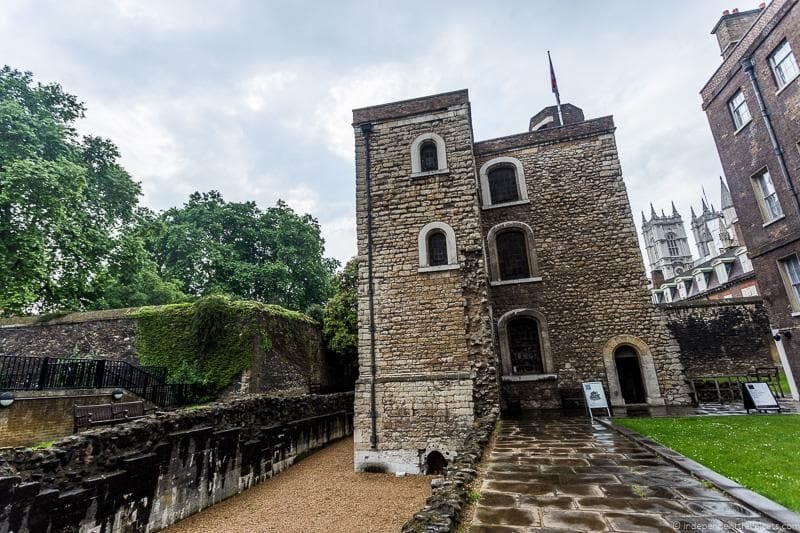 We’ll also mention a fourth site, The Jewel Tower, which may also be a place you want to visit, as it is part of the original medieval Palace of Westminster. Westminster Abbey sits on the site that has been used for all English and British coronations since William the Conqueror in 1066. Originally a Benedictine monastery, the oldest parts of the current Gothic church dates back to 1245, although most of the current church was built between the 13th and 16th century. In addition to coronations, it has also been the setting of over a dozen royal weddings, including Prince William and Catherine Middleton in 2011. It is also the final resting place of lots of famous people, from royalty to famous artists to notable scientists. 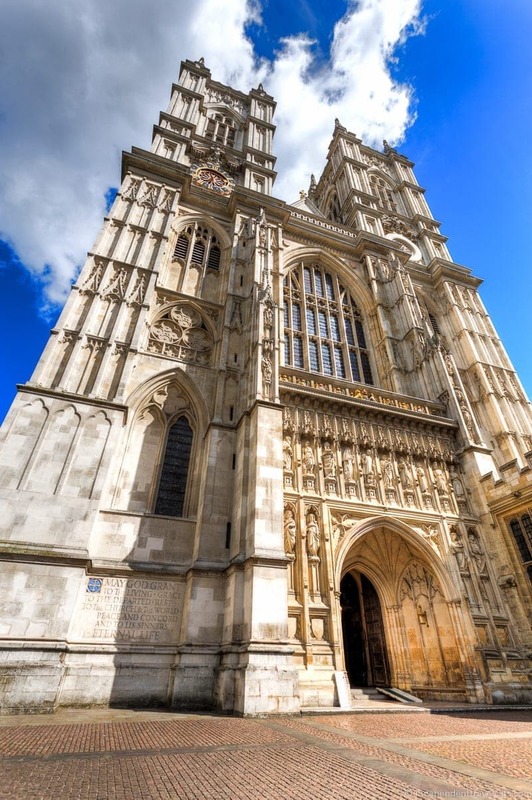 Westminster Abbey is a very popular visitor attraction so be prepared for potential lines. It is also a large church so leave plenty of time to explore so you have time to see the whole thing. Highlights include the nave, quire, high altar, coronation chair, Lady’s Chapel, Poet’s Corner, and the many shrines, graves, and monuments to famous figures. There are also other areas such as the Chapter House and cloisters that are worth checking out. The newest public area is the Queen’s Diamond Jubilee Galleries which opened in summer 2018. These galleries are located in the 13th century triforium and exhibits tell the history of the abbey and display a number of the abbey’s treasures. Admission to the Galleries is currently an extra £5.00. If you are searching for something specific (e.g., grave of The Unknown Warrior or tomb of Queen Elizabeth I), you can ask one of the abbey staff to point it out as it is easy to miss things as there is so much to see here! 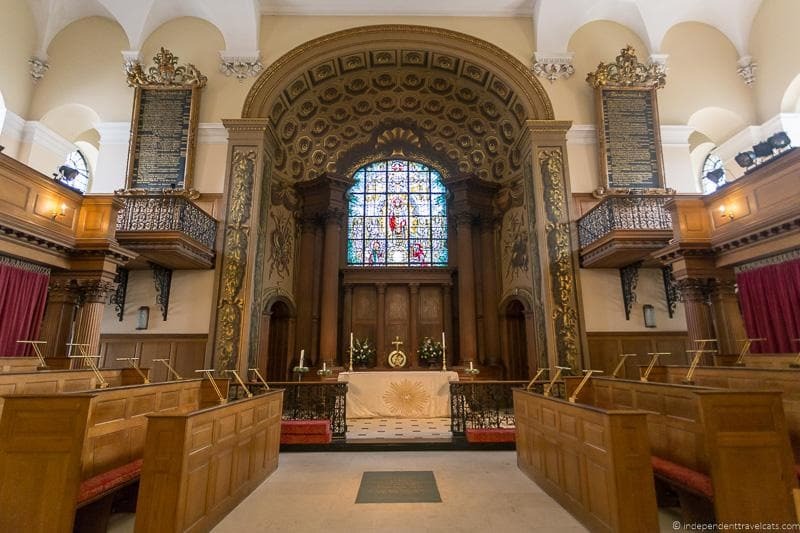 You can explore the church on your own with the included audio guide, or you can join a guide-led tours for a small fee. If you are interested in a guided tour, I’d check the Abbey website for tour times before your visit. 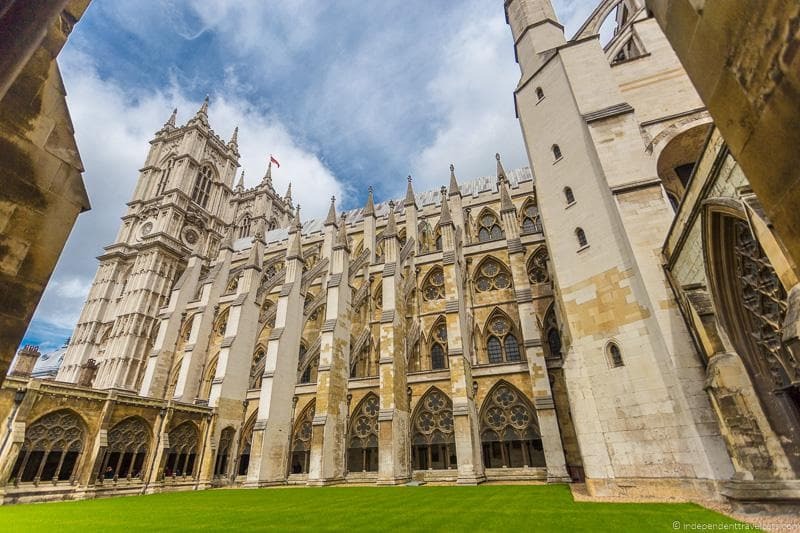 There is an admission fee to enter Westminster Abbey and admission is included if you have a London Pass. Westminster Abbey remains an active church and worship services and events also take place here regularly. The abbey is closed to visits on Sundays, religious holidays, and during special events, although visitors are welcome to attend worship services. St. Margaret’s Church sits next door to the much larger Westminster Abbey. 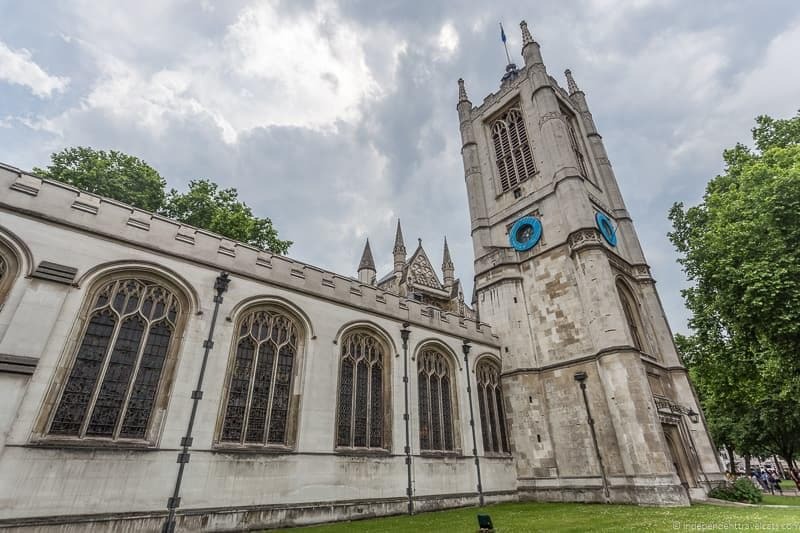 St. Margaret’s Church was built as a place where regular people could come to have mass and receive sacraments without disturbing the monks routine and worship within Westminster Abbey. It is believed that the earliest version of the church dates back to latter part of the 11th century, but much of the current church dates back to the 15th and 16th centuries. The Church is dedicated to St. Margaret of Antioch and is today an active Anglican Church. The Church continues to share a close relationship with Westminster Abbey. St. Margaret’s also has a close relationship with the Houses of Parliament. The Church has long been used by Members of both Houses of Parliament, and is often called the “parish church of the House of Commons”. The Church has been used by Parliament to celebrate notable events such as the service of thanksgiving at the end of World War I and a similar thanksgiving service on VE Day during World War II. Winston Churchill had a strong connection to this church as not only did he attend both of the mentioned thanksgiving services as a Member of Parliament, but it was also where he married Clementine Hozier in 1908. The Church is free to visit and is normally open daily. You can easily visit the church in 30 minutes. It closes for worship services and special events, but visitors are welcome to join the worship services. The original Palace of Westminster was a medieval royal residence, and a royal palace has sat on the site since the 11th century. After a fire in the 16th century destroyed much of the medieval palace, monarchs began using the Palace of Whitehall as their primary royal residence but Parliament continued to meet at the rebuilt Palace of Westminster. A number of fires and bombings would ravage the building over the centuries. 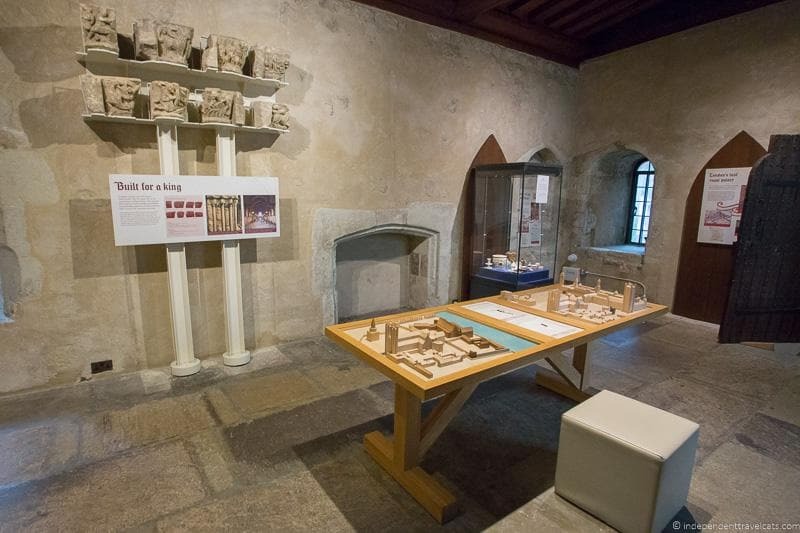 The oldest significant parts of the building open to the public are Westminster Hall (oldest building to survive although heavily reconstructed and restored over the centuries) and the medieval Jewel Tower (separate building discussed in next section). The majority of the present building dates to the 19th century and the palace remains the home of the Houses of Parliament. This iconic building is the main government building in the UK. It is probably most recognizable for its Elizabeth Tower with its famous bell, Big Ben. 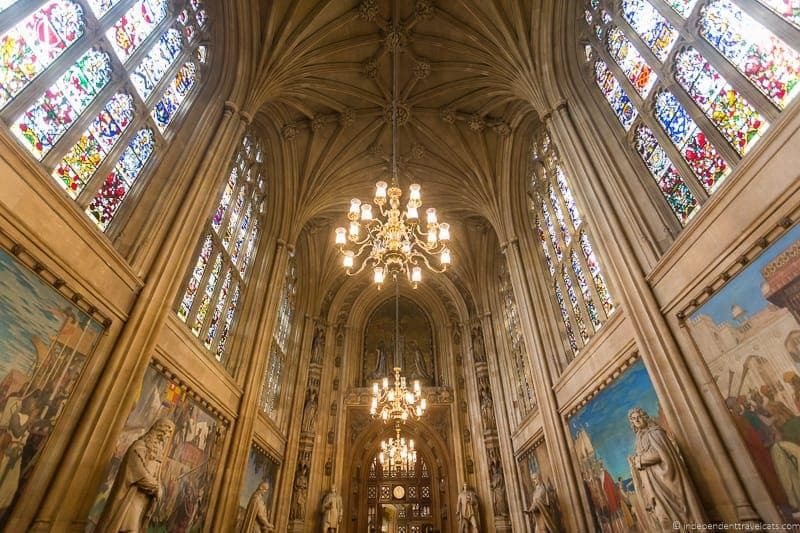 Tours normally include visits to a number of the most significant rooms, including Westminster Hall, St. Stephens Hall, the Commons Chamber, and the Lords Chamber. Note that you will need to go through airport-style security screening to enter the building. The Jewel Tower was built in the 14th century to house the treasures of King Edward II and was known as the “King’s Privy Wardrobe”. As noted earlier, The Jewel Tower is one of the only sections of the medieval Palace of Westminster to survive the fire of 1834. 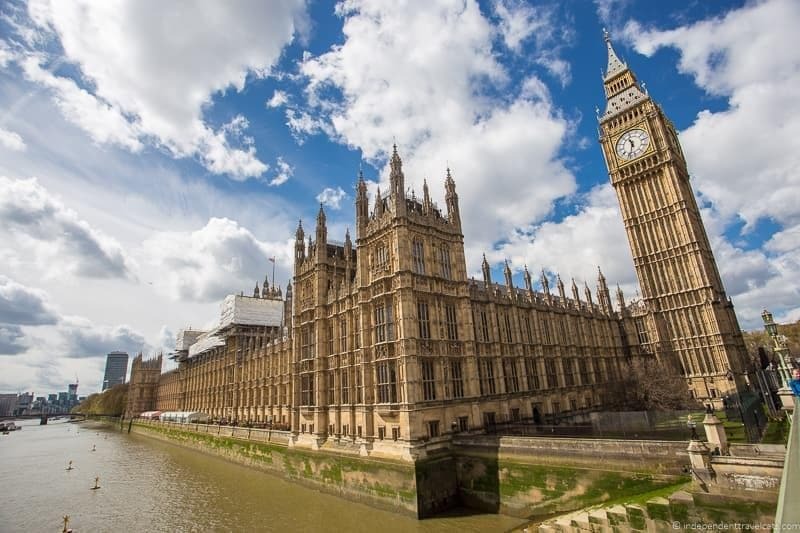 The tower would later be used for a variety of purposes including as a storage facility, records office of the House of Lords, and a facility for determining the value of weights and measurements. Today is is preserved as a historic monument by English Heritage and is open as a museum and historical site to visitors. Despite its location near several well-known London attractions, the Jewel Tower is a lesser known attraction with many fewer visitors. The exhibits in the tower present the history of the tower, its many uses, and recent archeological findings on the site. There is an admission charge to visit the Jewel Tower, although entry is free if you have a London Pass. There is a cafe on site on the ground floor. Note that you do need to be able to climb narrow steps to visit the upper stories of the tower. The Tower of London was inscribed as a UNESCO World Heritage site in 1988 for its significance related to history, culture, and architecture. The Tower of London was built by William the Conqueror and is one of the oldest buildings in London. At its center is the White Tower which is a notable example of Norman military architecture and the tower has a significant history as both a royal fortress and prison. The central White Tower was built by William the Conqueror in 1078 as a royal castle to protect London and show off his power. Over the years, the complex expanded to a number of buildings ringed by defensive walls. The site retained its current shape around the 13th century although building and restoration has continued on the site until modern times. The Tower has served as a fortress, prison, armory, and Royal Mint. It is also famous for being a place of execution for famous figures such as Queen Anne Boleyn, having a Royal Menagerie of exotic animals, and for housing the Crown Jewels. 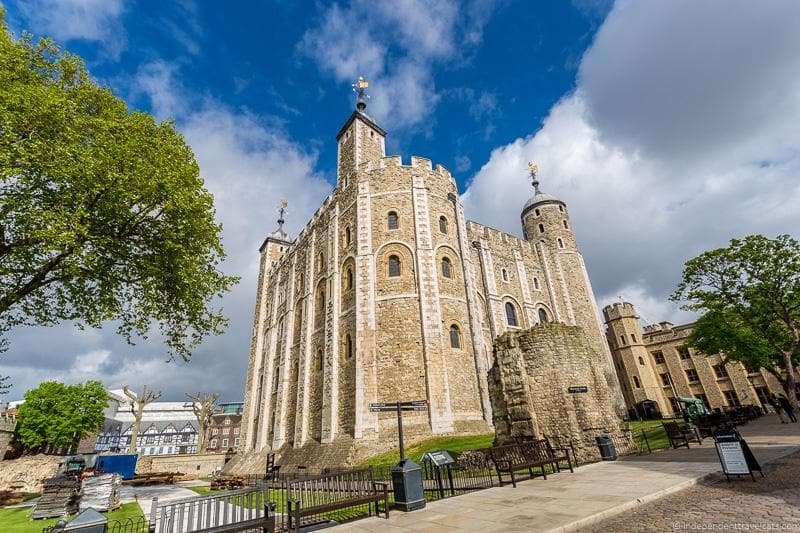 There are so many stories in British history connected to the Tower such as the execution of Anne Boleyn, the nine day reign of Lady Jane Grey, the mystery of the two princes in the Tower, and the execution of the German spy Josef Jakobs during World War 2. You may want to read some of these stories before your visit to help the history come to life. Today the Tower of London is one of London’s most popular tourist attractions. In fact, it has been a place that visitors have flocked to since at least the 16th century. It remains the home of the Crown Jewels and they have been on public display here (when not in use by the Royal Family) since 1699. 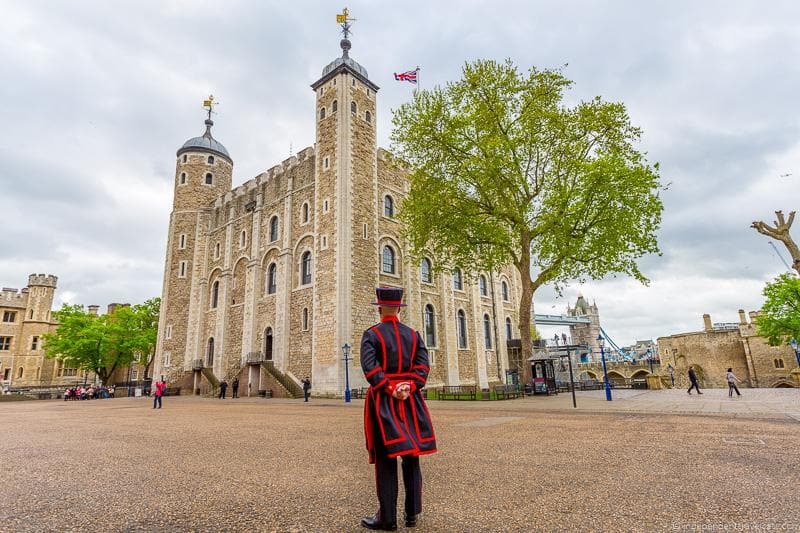 There is a lot packed in here and highlights include the Crown Jewels, White Tower, Tower Green, and tours given by the Yeomen Warders (Beefeaters). The Tower of London is a popular place so we’d strongly recommend trying to get here around opening as it can get very crowded. There is an admission fee to visit and entry is included if you have a London Pass. To make the most of your visit, I’d head to the Crown Jewels first, and plan to spend at least 2 hours visiting here. You can easily spend half a day here if you want to really explore and learn about its history. There are places to get food and drinks on-site. The next UNESCO World Heritage site in London is a bit unusual as it is not a building but a garden. The Royal Botanic Gardens, Kew (better known as Kew Gardens) was inscribed as a World Heritage site in 2003. These historic gardens were created in 1759 and were recognized by UNESCO for their large and diverse botanic collections, their royal history, the work of famous landscapes architects such as Capability Brown, and their significant contributions to study and education related to botany and ecology. Kew Gardens officially started as a formal royal garden in 1759 but it can be traced back even further to the garden in Kew Park begun by Lord Henry Capell of Tewkesbury in the 17th century. In 1840, Kew Gardens were adopted as national botanic gardens. The current gardens are set in 326 acres of land and are home to the the largest and most diverse collection of living plants in the world, and are used for numerous scientific projects. Today you can visit gardens, glasshouses, a royal palace, art museums, and outdoor installations within the garden. There are two historic royal residences within Kew Gardens: the 17th century Kew Palace and the 18th century Queen Charlotte’s Cottage. Both of these can be visited for free with the Kew Gardens admission ticket although the buildings are operated separately from the garden so do check the opening hours beforehand. 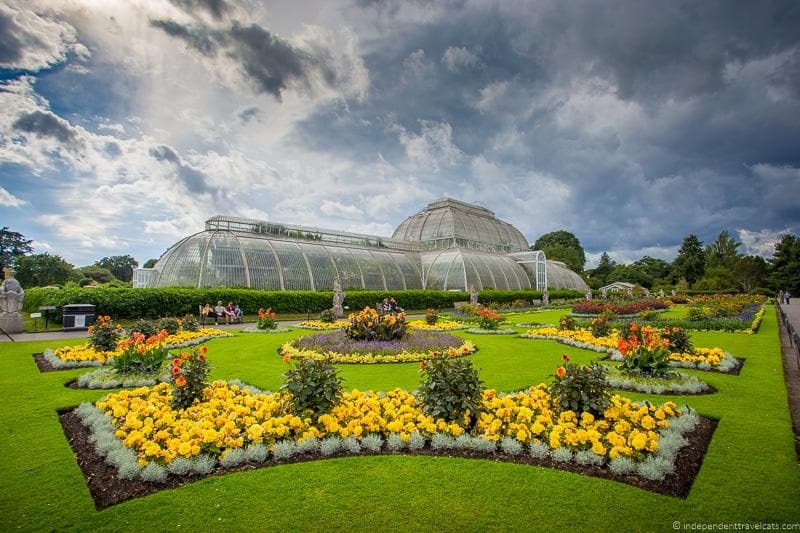 Some of the highlights of Kew Gardens include the Palm House, Temperate House, the Great Pagoda, Kew Palace, Waterlily House, and Treetop walkway. There is also a hop-on hop-off train that makes getting around the garden easier, and there are places to eat and drink within the gardens. There is an admission fee to enter the gardens, and free entry is included with the London Pass. You can explore at your own pace or join one of the garden’s guided walking tours that come free with entry. The gardens are huge and if you plan to visit most of the buildings and glasshouses, you can easily spend half a day or even a full day here. Just note that Kew Botanic Gardens is located in outer London and it takes about an hour to reach the gardens from central London via public transportation. The final London World Heritage site we’re going to talk about is another collection of buildings, only this time it includes a much wider area and more buildings than the Westminster site. 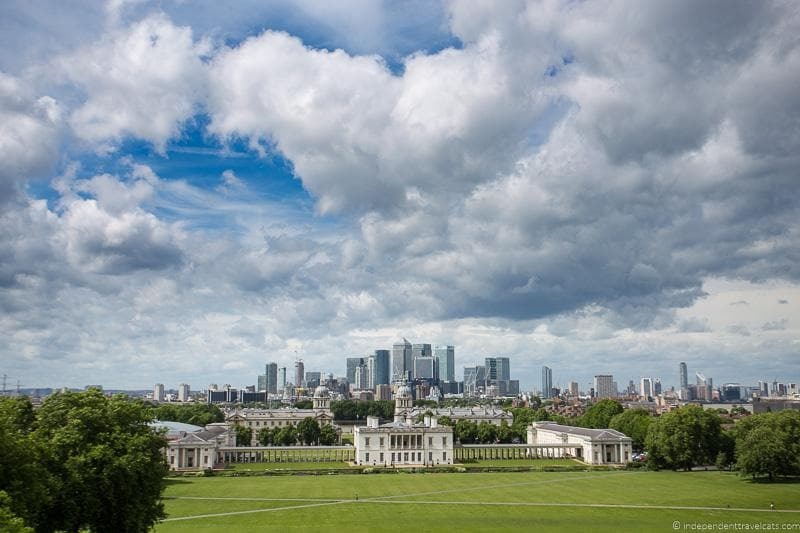 Maritime Greenwich was inscribed as a World Heritage site by UNESCO in 1997 and the site covers an ensemble of buildings in Greenwich as well as a park. It was afforded World Heritage status for its historic royal origins, its strong ties to British maritime history and Royal Naval welfare, and its association with a number of significant scientific, architectural, and artistic achievements in the 17th and 18th centuries. A large portion of Greenwich is encompassed within the World Heritage site, so I would plan to spend a full day exploring this area. 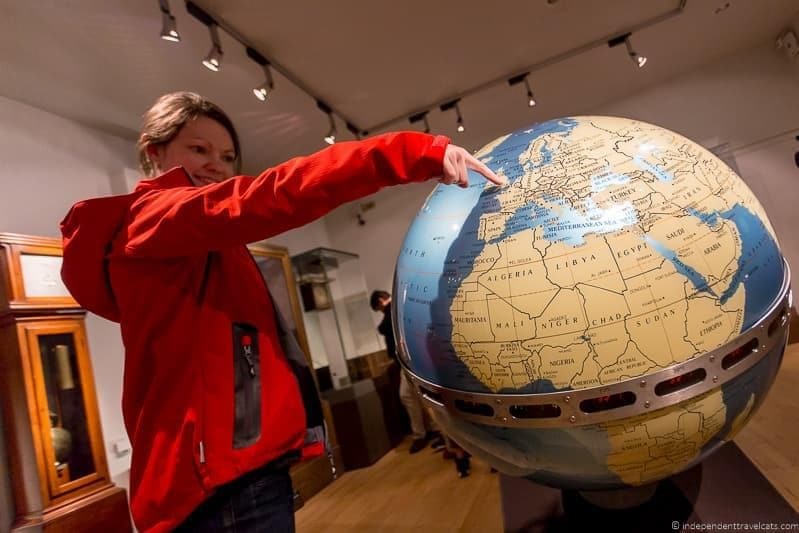 Although if you only have a few hours, you can choose one or two sites to visit such as the Royal Observatory Greenwich and the National Maritime Museum. The sites are within walking distance of each other, but you can also get around to some sites by public transit or a taxi. 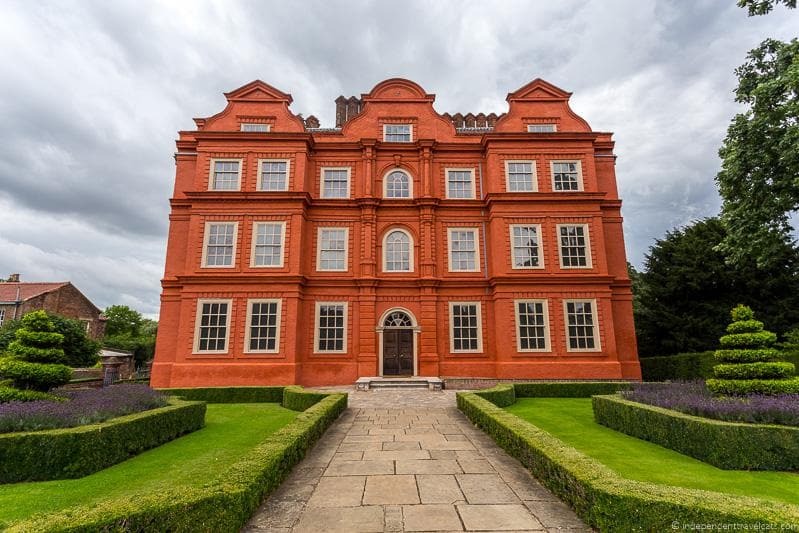 I’ll cover the sites that are most significantly associated with the World Heritage designation, but there are a number of other interesting places you may want to visit in Greenwich within these boundaries and beyond in Greenwich. See the final day of our 6 day London itinerary for a proposed route in Greenwich that covers most of these sites. 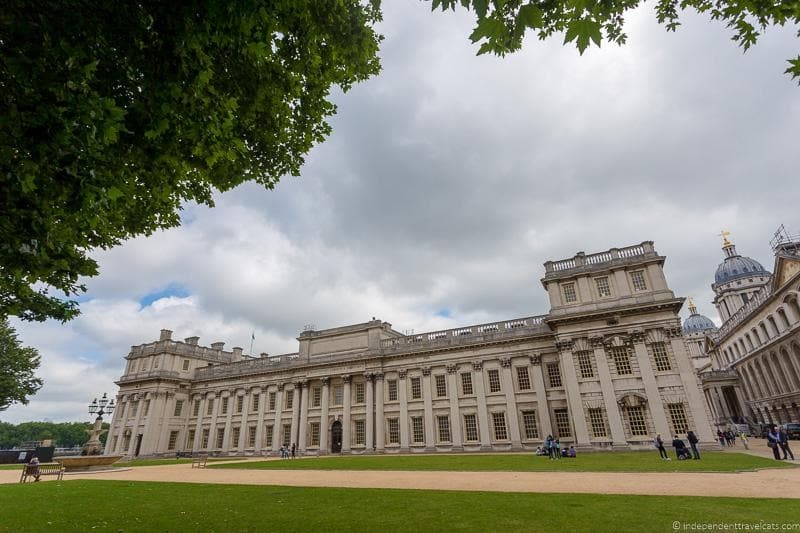 Several of the sites in Greenwich are free to visit and most of the paid attractions are free to enter for London Pass holders. The Old Royal Naval College is a set of buildings designed by Christopher Wren that original served as a place to care for and house retired naval seamen (called the Royal Hospital for Seamen). Later the large building complex was used as a naval training college. Today is used for a number of functions, and several of the buildings are open to the public. Prior to the building of the Old Royal Naval College, this was the site of the Palace of Placentia, also known as Greenwich Palace, which was the birthplace of King Henry VIII and a favored Tudor palace. We’d recommend starting your visit at the Greenwich Visitor Centre which has some helpful information, displays, and artifacts. 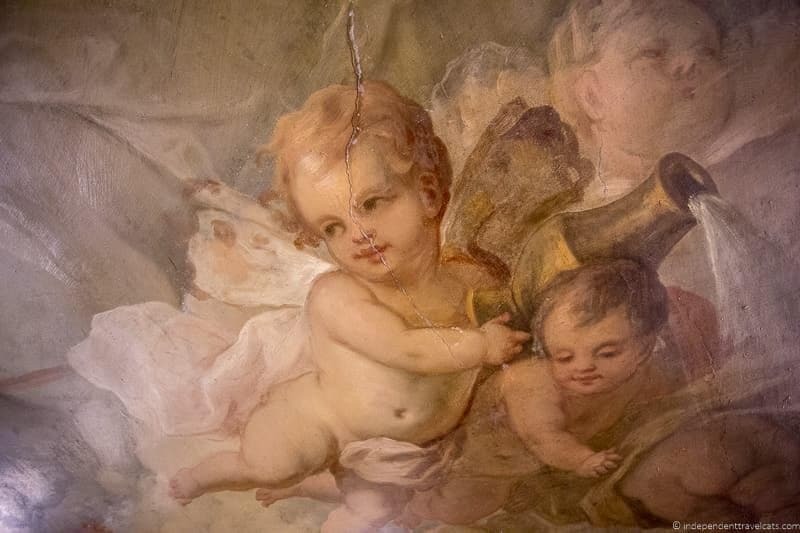 Then you can wander around the site to admire the buildings, and you can visit the Chapel and the beautiful Painted Hall, painted by James Thornhill in the early 18th century. Guided tours can also sometimes be arranged in advance for those with a special interest to see more areas of the complex not usually open to the public. Some areas of the complex, such as the visitor center and chapel, are free to visit while other areas and tours may incur a small fee. The National Maritime Museum is a museum dedicated to the dramatic maritime history of Britain. 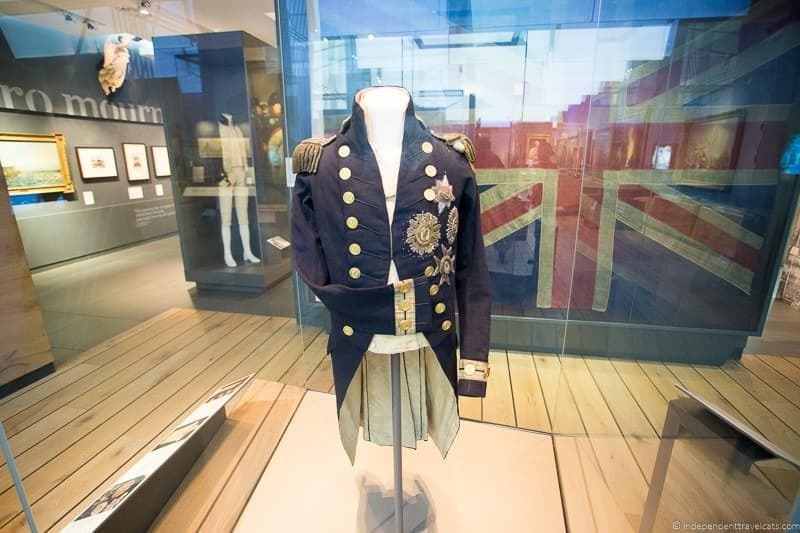 The museum is huge and is one of the largest and most comprehensive maritime museums in the world, covering everything from shipping and trading to military sea battles to British seaside culture. 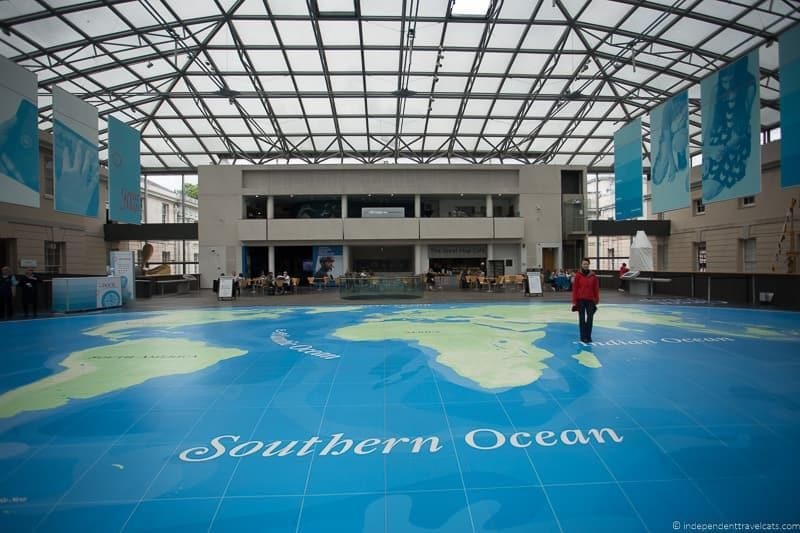 The museum is packed with information, artifacts, and fun interactive exhibits. The museum is free to visit (although there may be a charge to see temporary exhibitions). You can easily spend a few hours here. There is a café in the museum serving food and drinks. 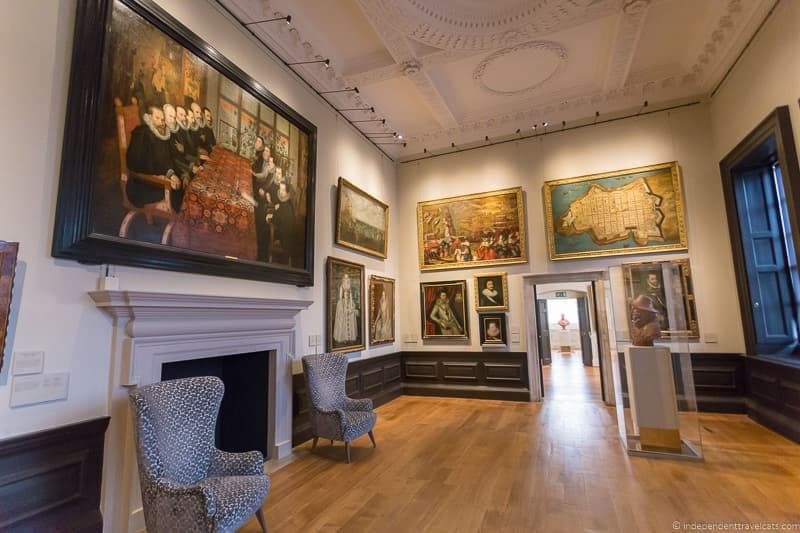 Not far away, within the same complex, you can also visit the Queen’s House, a beautiful former royal residence designed by famous architect Inigo Jones. It was the first Palladian building built in England and today showcases a fine collection of art. Greenwich Park is one of several large royal parks in London. 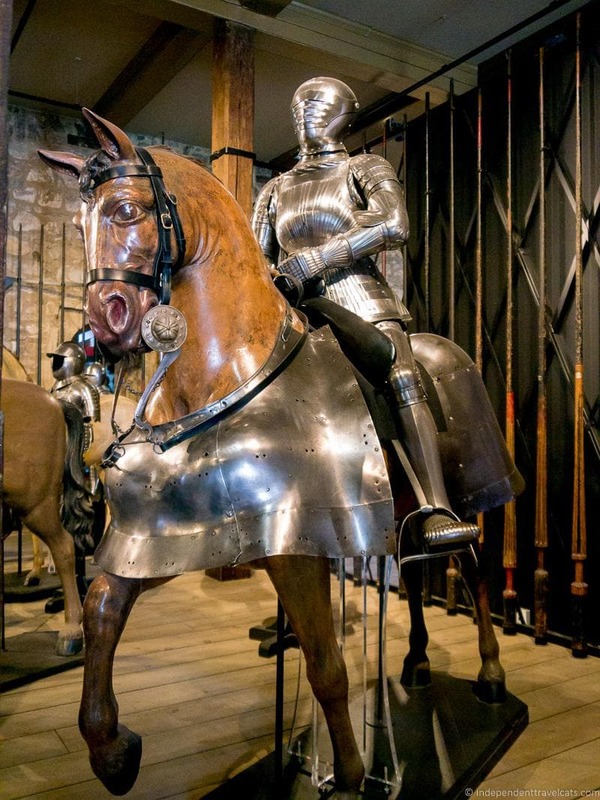 It started as a royal hunting part in the 15th century. In the 17th century, the park was landscaped using designs by landscape designer André Le Nôtre, and today the park mostly has retained this planned form and design. The park was opened to the public in the 18th century, and today is a popular green spot for locals and visitors to London. Within its 183 green acres, you’ll find a number of attractions, historical ruins, memorials, sporting fields, a deer park, and gardens. Some of our favorite places are the rose garden, the Ranger’s House which houses the Wernher Collection of art, and the Royal Observatory Greenwich. Note that the park is fairly hilly in places but climbing the hills will give you some nice views over the city. The most popular site for visitors is the Royal Observatory Greenwich. This observatory has played a significant role in the history of astronomy and navigation, and it is best known for being the location of the prime meridian. 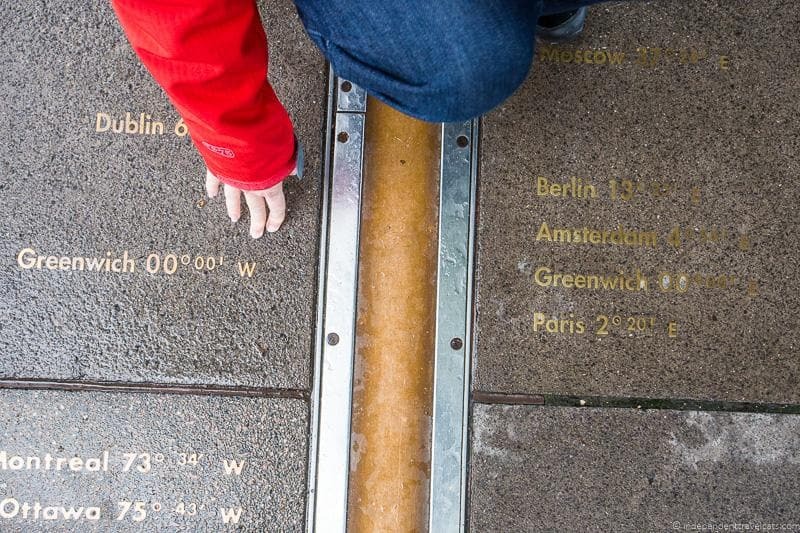 It was from here that the name was given to Greenwich Mean Time (GMT). 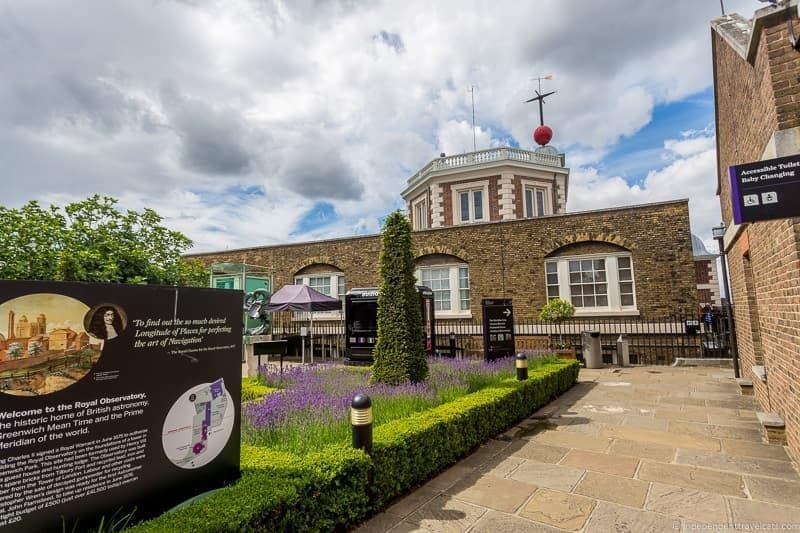 The site is now a museum and visitors can learn about the history and discoveries at the observatory, stand on the famous Meridian line, visit Flamsteed House, visit a camera obscura, and view the great equatorial telescope. There is an admission fee to enter and the admission cost includes an audioguide to make the most of your self-guided visit. Located near the Royal Observatory Greenwich is the interactive Astronomy Centre and the attached Peter Harrison Planetarium, which is currently London’s only planetarium. The Astronomy Centre is free to visit although there is a cost to attend a planetarium show. There is also a small cafe located here. Note that there are significant hills in Greenwich Park, especially the steep hill up to the Royal Observatory and Planetarium, and may not be difficult for those with mobility issues, especially those in wheelchairs. Paid public car parking is available in Greenwich Park at the top of the hill. You may want to call in advance if you have questions about the accessibility of certain sites and buildings within the park or Royal Observatory. 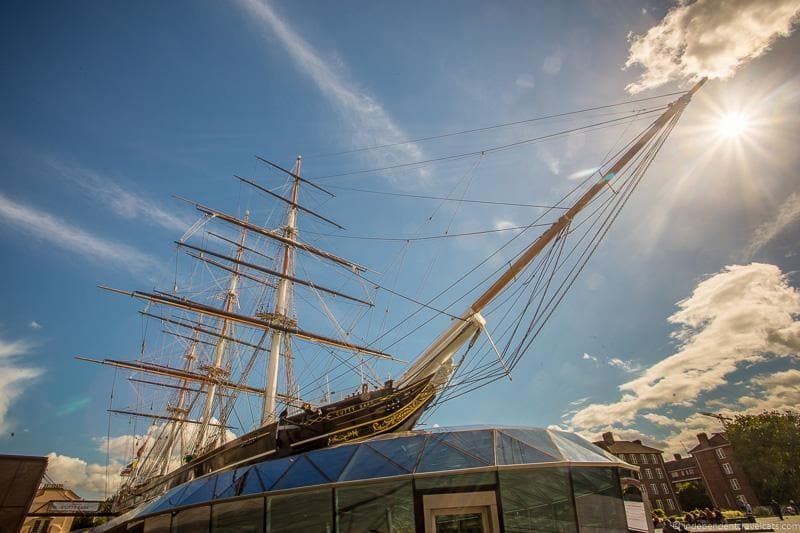 One of the most popular Greenwich attractions is the Cutty Sark, a British clipper ship built in Scotland on the River Clyde in 1869. Visitors can board the ship and learn about its history as one of the last clipper ships built and one of the last surviving clipper ships from this period. Other attractions include the parish church of St. Alfege, Greenwich Pier, the old Georgian town center, The Fan Museum (offers a good value afternoon tea), and Greenwich Market. So there is our review of the World Heritage sites in London! Hopefully this has given you a good overview of these popular attractions. If you are planning a trip to London, be sure to check out our other London travel articles! Did you know how many UNESCO World Heritage sites there were in London before reading this? Which of these would you love to visit the most? Have you visited any, or all, of these sites? If so, feel free to share any of your own experiences in the Comment section below. 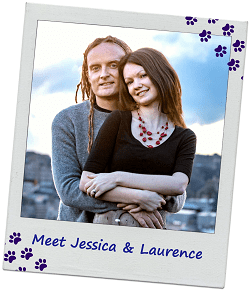 If you have any questions about visiting London, just ask, and we will try our best to help! It will be my first visit to London and I likely won’t make it a priority to see all of them since there will are so many attractions already vying for my attention but it’s a great list for future visits! Awesome blog. Looking forward to visiting London again in the future (near future 🙂 ). Visited all these sites except for the Botanical gardens, should have been there when we visited Richmond Park. Well that might be a rain check!! This was a great read and loved the photography! London is such an amazing city to visit — and while I got to a few of these UNESCO sites on my trip there a few years ago, I missed a lot. Thanks for bringing them all together in a single list. I had no idea Kew was a UNESCO site! That’s very cool. The only one I haven’t visited is Greenwich – I keep saying “next time I’m in London,” and then somehow always manage to be too busy! This is great. We always try to hit UNESCO sites when we travel, but we’ve obviously missed some in London. Wow! 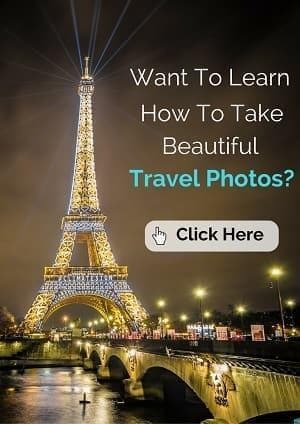 Great information on one of my favorite cities. 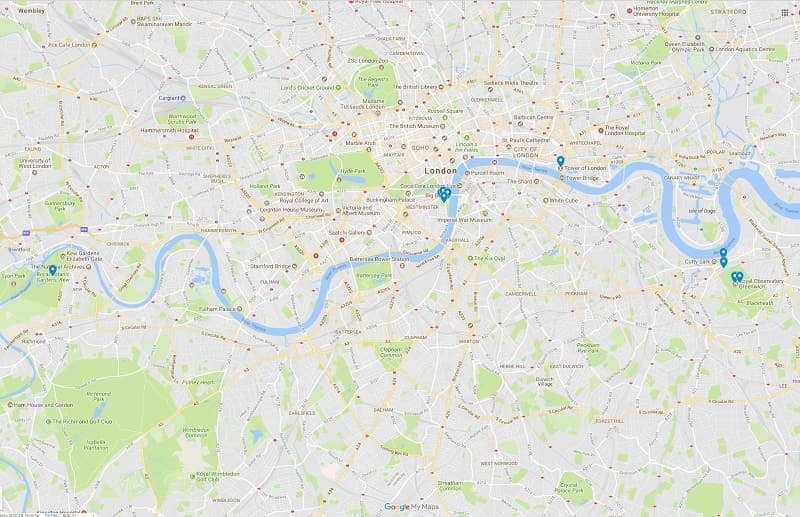 I’ve bookmarked this to look over the next time we’re in London. Can’t wait to check out the Jewel Tower. Thanks! A great post as always, with really good photography too! Some real favourites here, and plenty to enjoy over the winter months if you’re visiting the capital, actually they are all great all year round. I have actually been to a few of these, as I’ve been to London a couple of times. That shot of the gardens sure is appealing right about now, as I look out my window onto a mostly brown and gray winter day! I’ve never been the Greenwich Maritime Center, that would be fun. Maybe next time I go!